The Disney Store in New York is Disney’s toy shop on Times Square. Here you can find the prettiest Elsa dresses, Toy Story figures and Finding Nemo games. Of course, you can also get hold of merchandise from the latest Disney films. 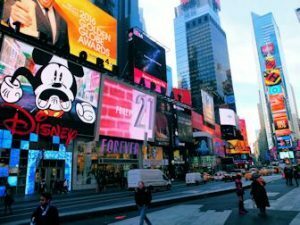 The Times Square store is Disney’s flagship store in New York. Not only is it a great place to shop with your kids, they have really gone all out with the impressive interior. Children and adults alike will be awe-struck at the mere sight of it. Spread over two floors, The Disney Store on Times Square is full to bursting with dolls, dvd’s, clothing and other Disney themed products. Here, you can find absolutely everything from your favourite Disney films: from Frozen to Peter Pan, Wall-E to The Lion King. Everywhere you look you can see wall to wall Disney toys and merchandise! On the second floor you can even find a princess castle that will be sure to impress the little girls. For the boys there are also a myriad of treasures in this colourful shop. 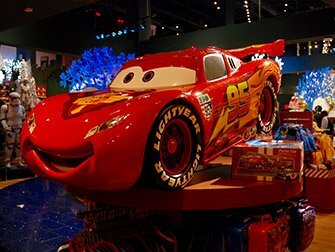 How about the cars from Cars and a Marvel Comics department? The shop staff are super enthusiastic and regularly encourage a Disney sing along: feel free to sing along loudly! 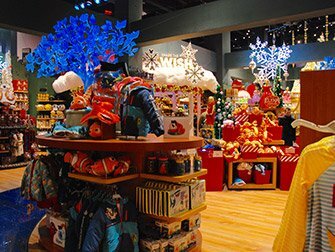 If you are looking for more shopping after your trip to the Disney Store, you can pay a visit to the close by M&M’s Store. Eric’s Tip: The Disney Store on Times Square isn’t huge, but definitely worth a visit if you are in the area, especially with children. There is something for every budget. Even if you don’t want to spend a lot, you can still take home a nice Disney souvenir!